coldest beer in the valley. 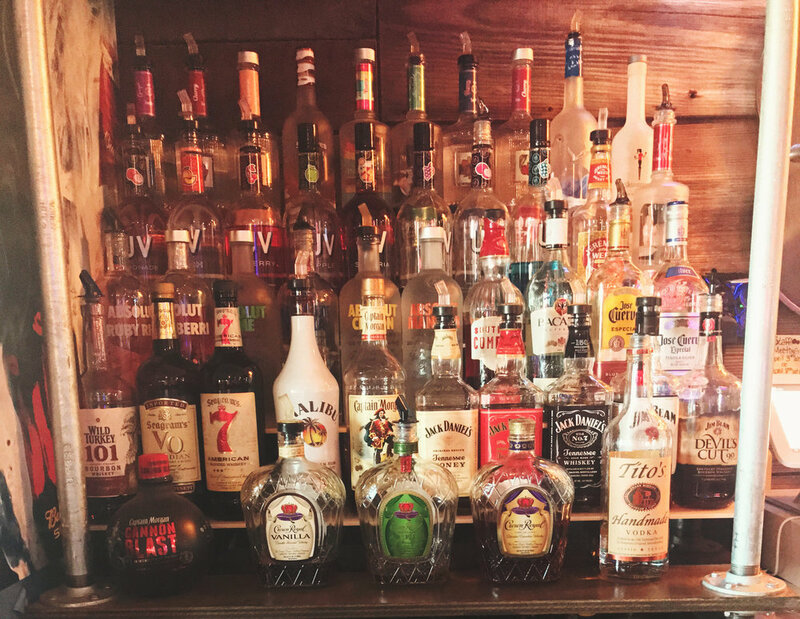 Located in Belleville, South Gate Saloon is a purveyor of down-home American drink & dine in Southern Illinois. 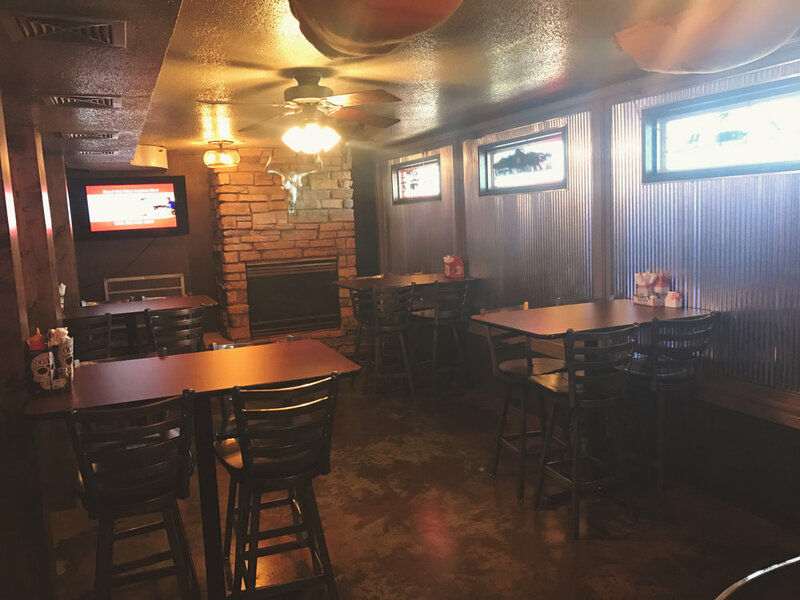 South Gate Saloon opened in September 2015 and is located conveniently next to Scott Air Force Base. Since then, owner Kimberly Schewe has been serving both quality interpretations of classic dishes and daring new ventures into her own creations with a fully operational kitchen. 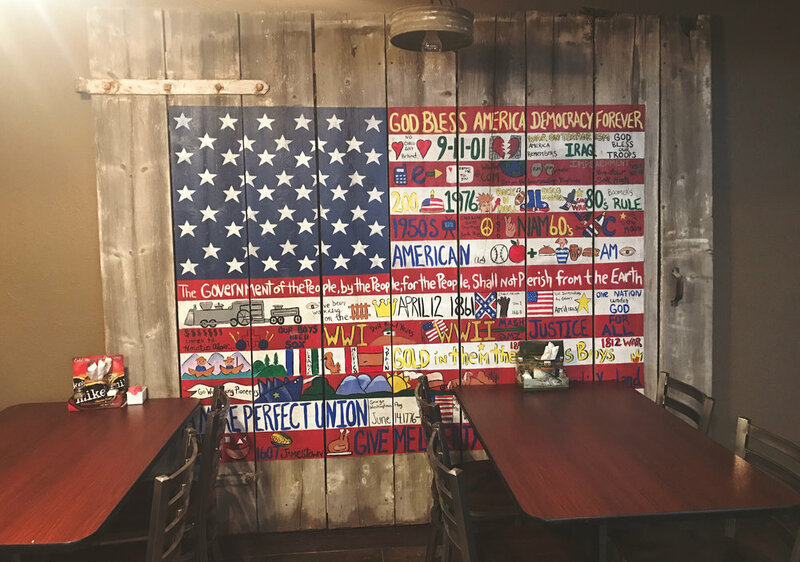 South Gate Saloon's interior, designed by Schewe herself, reflects the country sensibilities of the surrounding area while also paying tribute to America's storied past. The multi-roomed bar offers the choice to observe passers-by from large roadside windows, or sit at spacious table top bars while enjoying a plethora of drink and dine options. Video gaming and jukebox music available daily. Full Kitchen open every day till 9pm. Pizza and appetizers available till 10pm. Like toasted ravioli but oh so much better. lettuce, with onion, tomato, and crouton. Available Dressings: Ranch, Italian, Caesar, French, Mustard, Bleu Cheese, 1000 Island,Wasabi Ranch, and 161 Sauce. $6.50 - 9" / $8.50 - 12" / $10.50 - 16"
$8.00 - 9" / $10.00 - 12" / $12.50 - 16"
Made with spinach artichoke dip, onions, sliced tomatoes, green peppers, black olives and mushrooms. $9.00 - 9" / $11.50 - 12" / $13.50 - 16"
$10.00 - 9" / $13.50 - 12" / $15.00 - 16"
Brisket, sausage, pepperoni, and bacon. $9.00 - 9" / $11.00 - 12" / $13.50 - 16"
BBQ sauce, pulled pork, bacon, onion, and cheese. $8.50 - 9" / $10.50 - 12" / $13.50 - 16"
$8.50 - 9" / $12.50 - 12" / $13.50 - 16"
mustard base, bratwurst, cheese, sauerkraut, and onions. Spinach and artichoke sauce, grilled chicken and mushrooms. Pepperoni, sausage, bacon, ham, chicken, onion, mushroom, tomatoes, black olives, green peppers, japans, pineapple, sauerkraut. Spicy Mustard, Ranch, Sweet Baby Ray's, BBQ, Spinach and Artichoke. Bacon, chives, and cheese sauce. Pulled pork, chives, and cheese sauce. French fries, ale fries, chili, pulled pork, bacon, onions, and cheese sauce drizzled with 161 sauce or ranch. Fried pickles, cauliflower, O'rings, and green beans. Steak bites, chicken stripes, cannelloni bites, and candied pepper bacon. Ham, pepper bacon, provolone cheese with dijon butter sauce. Pulled pork carina mustard topped with slaw on mini rolls. Sauce choices: honey garlic, bbq, teriyaki, buffalo, honey mustard, garlic parmesan, burbon, sweet chili, south gate, and honey citrus. Served with lattice chips. Substitute fries or slaw for $1.50. Substitute O'Rings for $2.50. Ham, American & Swiss cheese, grilled onions on grilled sourdough or rye. Corn beef, creamy sauerkraut & swiss cheese on grilled rye. Fried bologna topped with slaw & chips on grilled sourdough. beef brisket, pulled pork, fried bologna, with proven or pepper jack cheese. Grilled chicken, provolone, and bourbon sauce. Served grilled, crispy, spicy with lettuce, cheese, & your choice of sauce. Wrapped with cole slaw and carolina mustard sauce. 6 slices of candied peppered bacon. Cinnamon and sugar, drizzled with your choice of sauce.